Set to open in early 2017 in the heart of downtown, the AC Hotel Asheville Downtown (a boutique brand by Marriott) is teaming up with Asheville food scene veterans. Peter and Martha Pollay of Posana restaurant will consult on the hotel’s food and beverage program, as well as a new rooftop restaurant and bar Capella on 9. The Cambria Downtown Asheville, set next to the historic Grove Arcade, will open later in the year with two new restaurants. Asheville’s Rooftop Bar Trend Goes Over the Top: The AC Hotel Asheville Downtown brings the latest rooftop venue to downtown after the Pillar Bar at Hilton Garden Inn Asheville Downtown and Montford Rooftop Bar at Hyatt Place Asheville Downtown opened earlier this year. For 360-degree mountain views outside of downtown, try Highland Brewing Company&apos;s new rooftop space and bar. INSIDER SAVINGS: Beginning January 1, book an overnight winter visit to enjoy the lowest rates of the year AND receive a complimentary gift. Learn more about Asheville Peak Perks. More than 40 award-winning costumes from films such as Finding Neverland, Sherlock Holmes and Pride and Prejudice are on display at Biltmore February 10 through July 4. The exhibition “Designed for Drama: Fashion from the Classics” is inspired by George Vanderbilt’s love of literature and focuses on films based on favorite books in his collection. The original books from his library of more than 22,000 volumes will accompany the costumes, marking the first time that most of the books have been displayed to the public. More info. Tucked away next to the Omni Grove Park Inn are six English-style cottages with historic ties to Biltmore and mountain craft traditions over 100 years old. Newly named Grovewood Village will welcome guests for special experiences in 2017. See the Looms that Created “Coolidge Red” and “Hoover Gray”: Beginning in April, free guided history tours will be offered at 1 p.m. each Saturday. Visit the buildings that still house most of the equipment used when Biltmore Industries gained world-wide recognition for its furniture and hand-woven wool, some created specifically for presidential families. A celebration of Grovewood Gallery&apos;s 25th Anniversary will occur May 20, and June 17 marks the Centennial Anniversary of Biltmore Industries at Grovewood Village. Guitar Bar that Rocks: Music can be experienced every night of the week at Asheville Guitar Bar, tucked away in the Cotton Mill Studios. This new music venue has a cozy bar, blues-infused dance floor and music-themed art installations everywhere you look. Try Your Hand at Pottery…or Glassblowing: Glass artist John Almaguer’s new Asheville Art Studio Tours lead participants on a behind the scenes walking tour of the River Arts District. The Experience Tour offers guests the chance to be the artist and work in multiple mediums. Famous BBQ and Beer on the Move: Well-known 12 Bones Smokehouse is moving to a nearby location in the River Arts District that will also house the second location of Asheville favorite Wedge Brewing. The Foundation - known for its ever-changing graffiti-covered exterior - has a plan for continuing public art projects. Stand Up Paddle on a REALLY Big Board: Wai Mauna - known for its Dawn Patrol SUP tours - will add a massive, six-person paddleboard and, for those looking to try one of the newest watersport trends, whitewater SUP lessons and tours in 2017. Belly Up to the River: New this spring, Bellyak tours will begin on the French Broad River. Invented in Asheville, this watersport takes place on a face-first kayak that you ride on your belly. Trail with Hollywood Ties Reopens: The popular Skyline Trail that leads to the top of 404-foot Hickory Nut Falls in the Chimney Rock section of Chimney Rock State Park is slated to reopen in 2017 after being closed for almost 10 years. The area near the top of the falls (where the final fight scene in the 1992 film The Last of the Mohicans occurred) will once again provide guests with incredible panoramic views. Finally! More Seats at One of Asheville’s Most Sought-After Restaurants: Award-winning Chef Katie Button and her team are expanding their Spanish tapas restaurant Cúrate. In addition to more seating at this popular restaurant, an expanded food and beverage program will focus on the concept of vermouth bars in Spain serving small bites, Spanish vermouth, sherry and cider. Burial’s Forestry Camp Celebrates Parkway History: Asheville’s Burial Beer Co. has started brewing at Forestry Camp, their second location, set in buildings that once housed the young Civilian Conservation Corp workers who built the Blue Ridge Parkway. Next steps at the Biltmore Village area location include a bar and restaurant opening mid-2017 and a new line of sour and wild farmhouse ales. NEW IN FOOD: Meat-heavy Bone & Broth; savory English pies from Pete’s Pies; a new picnic menu from John Fleer’s The Rhu (perfect for a scenic vista along the Blue Ridge Parkway) and foraging tours from No Taste Like Home that pair cooking classes and dinner at historic Hickory Nut Gap Farm. Board Game Café Concept Comes to Asheville: Set to open in early 2017, Well Played, a board game cafe, will offer more than 500 gaming titles, locally-sourced comfort food, desserts, beer, wine and coffee. Prominent in Europe and Asia (and the first of its kind in North Carolina), this new downtown spot will be perfect for families by day and a grown-up venue by night. Just Launched! Kids’ Comedy Tour: LaZoom, known for its big purple bus and wacky comedic characters, now offers a kids&apos; comedy tour geared for 5 to 12-year-olds. Part-history, part-hilarious, the tours last about 60 minutes. Roam Mars Via Robot: Currently operating on a soft launch, the Asheville Museum of Science (AMOS) is set to fully open late winter of 2017. Exhibits include a hurricane simulator, expansive mineral collection and a Mars Rover demo course. New Family Travel Package Based on Best-Selling Young Adult Series: The third installment in the bestselling book series by author Robert Beatty, “Serafina and the Splintered Heart,” hits bookshelves July 4. The books follow the adventures of a 12-year-old girl who lives hidden away in the basement of Biltmore during the time of George and Edith Vanderbilt. 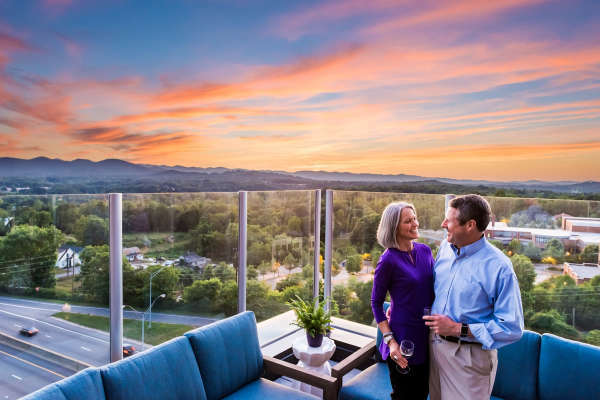 Visit Serafina’s magical Blue Ridge Mountains: The Serafina Package from the Grand Bohemian Hotel Asheville features accommodations, tickets to Biltmore, a guide to Serafina&apos;s mountains and Serafina Dark Forest ice cream from The Hop. Alex Matisse, great-grandson of renowned French painter and cutout artist Henri Matisse, and his wife recently opened a retail location for their WNC-based East Fork Pottery in downtown Asheville. Matisse, who creates all his clay and glazes by hand, using local ingredients, makes simple objects for the home. Also New: Fox & Beaux, focusing on high-end hand-crafted jewelry, and Asheville Direct Brand Gallery, a grab-and-go convenient store with all-local items, opened downtown in 2016. The Biltmore Village area grows its art offerings in a trendy new area along London Road. Check out art exhibitions, furniture and funky home goods at London District Studios.